Last year I was able to take several wheel throwing class at Baltimore Clayworks after a hiatus from the wheel for almost 20 years. I love love love clay and being in a ceramics studio. But when you have to deal with annoying things like arthritis and aching hands, working with clay can be too difficult. Now that my kids are older and I get more sleep and have medication that works I felt like I could get back into the clay studio. Yesterday I had a studio visit from a fellow artist as he and I will be doing a 2 person show this spring and I had pulled all my recent and a few older paintings together for us to look at and discuss what would go best with his work- there were a lot of stripes and dots in my collection! Stripes have shown up in my work for a long time, but polka dots are fairly recent. 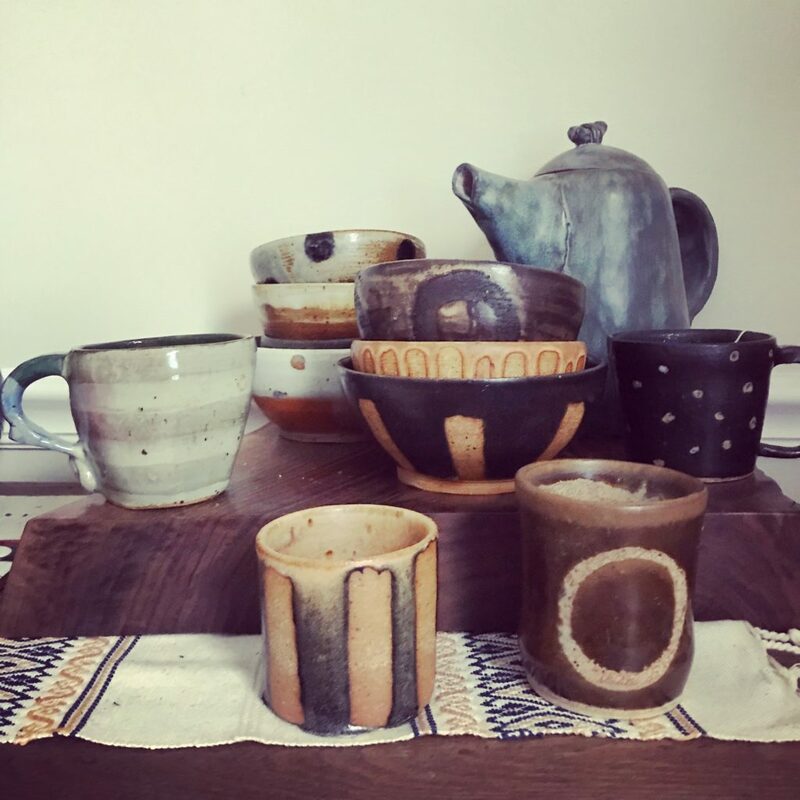 I was thinking about it last night and this morning I amassed most of my pottery that I made this past year in my wheel classes. Lo and behold, almost everything I glazed had stripes, dots or circles. The only thing in this collection that did not was my teapot in the background, which is handbuilt and I made it in high school. It was already sitting on the wood piece before I brought my bowls and mugs over and I left it there for the photo. It made me think about how pretty much everything in my life somehow filters into my paintings at some point. The thing that I love about working with clay is that is from the earth. It is just incredible to me that you can take a lump of mud and form it and bake it and then you have a functional vessel. Humans have been doing this since our very beginnings, but it just fascinates me and I feel connected to these ancient practices and back to the earth. Your pottery is beautiful, Bridgette and it compliments your paintings so well. I love your strips and dots, and in fact, am looking at one of your paintings (with stripes) that's hanging on my wall right now! Thank you Leslie! I love that one of my striped paintings is living with you. Thank you so much!